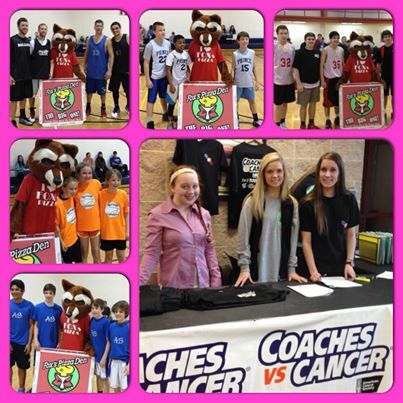 Join us at the Malcom Bridge Middle School gym on Friday, January 16th, and the North Oconee gym on January 24th as our Oconee schools come together for a wonderful Coaches vs. Cancer event! Frankie the Fox’s Pizza fox will be in attendance, and Coaches v Cancer t-shirts are available for purchase at the high schools. All proceeds benefit Coaches vs. Cancer, including a halftime “knockout” challenge for a chance at a Fox’s 30″ “Biggest Pizza in Town”! Support this event, organized and supported by area high school students. 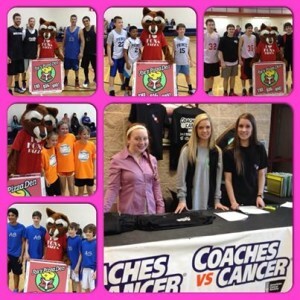 Also, contact Oconee Veterans Park to sign up for a 3 on 3 Coaches vs Cancer basketball tournament. Winners in various age groups will compete for the championship, plus “Free Fox’s for a Year!” (*one 9″ Fox’s pizza per month for up to 12 consecutive months) The 3 on 3 tournament is scheduled for Sunday, January 25th. Visit the Oconee Parks and Recreation CvC page for more information and to sign up!